What happens to a 1.2-million-square-foot aluminum plant when skyrocketing energy costs force its doors closed forever? In the wrong hands, it could become a massive pile of rubble languishing in a landfill. 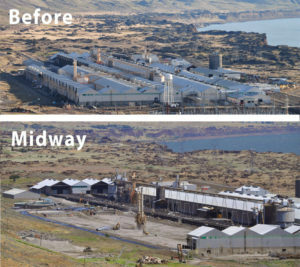 However, when the Goldendale Aluminum Plant in southern Washington shut down in 2003, the owners insisted on hiring industrial demolition contractors who could dismantle the plant with a minimal amount of waste sent to the landfill. That meant thousands of tons of materials – and truckloads of usable equipment – would need to be carefully extracted, sorted, processed and repurposed or recycled. It was a project J.D. Elder, president of Elder Demolition, had been preparing for since starting the company in 1997. Back then, the contractor specialized in selective demolition of interior commercial spaces. Their previous work involved meticulously picking apart materials in tight urban spaces. Elder invested in state-of-the-art shears and other equipment that offered almost surgical precision. Owning the right equipment paid off as the company transitioned to total structural demolition of industrial and commercial buildings. 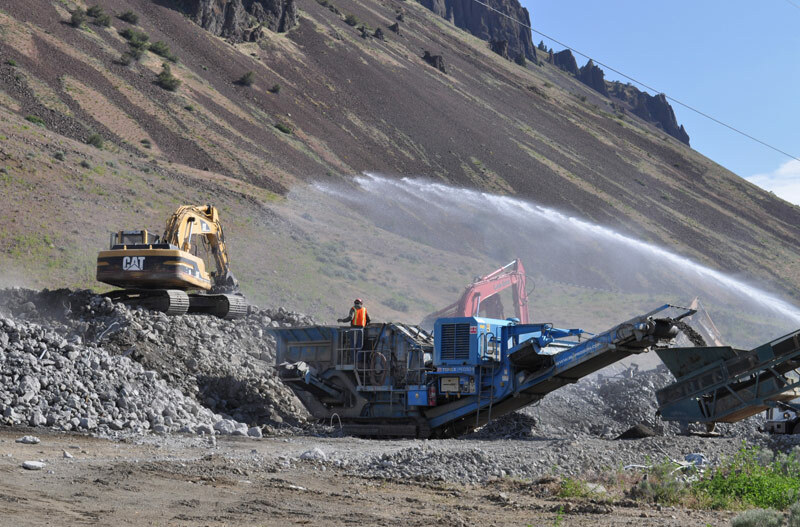 For eco-conscious industrial demolition contractors, Oregon offers plenty of green demolition opportunities – and Elder’s crew is often able to reuse or recycle up to 95 percent of a job’s materials. 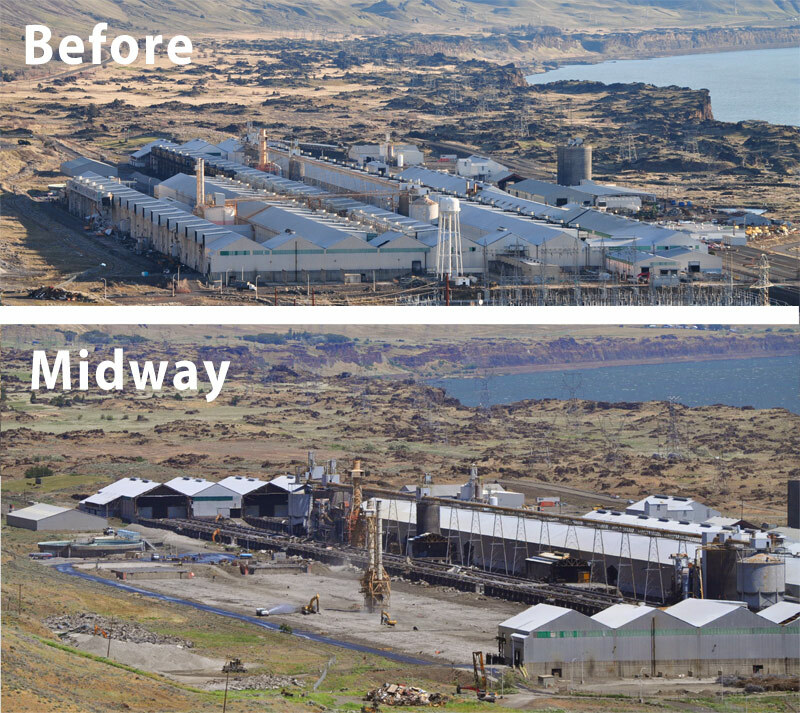 So when the bid for the Goldendale plant came around, they were ready. 35,000 tons of structural steel. 10,000 tons of aluminum siding, roofing cable, conduit and copper wire. Boilers and other usable equipment. There were also truckloads of perfectly functional industrial equipment salvaged from the plant. Ultimately, an entire building’s worth of machinery was sold for reuse. The steel, aluminum, copper, roofing cable and siding were all recycled. In the end, only 2,000 tons of debris went into the landfill – a mere 1 percent of the total demolished materials. The RE Store’s green demolition and salvage services haven’t ever taken on a project this large, but we have worked with major demolition companies like Nuprecon and others. Thanks to Elder Demolition for their guest post. Elder Demolition is a fully licensed and insured commercial and industrial demolition company, with certifications for hazardous waste handling as well as broad experience with LEED-certified green demolitions.